Looking for a Dazzling and Confident Smile? Invisalign® can give you the beautiful straight teeth you've always wanted. It works through a series of clear, removable and comfortable aligners that no one can tell you're wearing. You'll find yourself smiling more during treatment as well as after. Invisalign has been proven effective and is widely available. If the idea of metal braces is holding you back from the smile you always wanted, wait no longer! Invisalign is a state-of the-art alternative to traditional braces. There are no metal brackets or wires. Instead, the system is based on clear "aligners" that are custom made just for you. These undetectable aligners are designed by a computer. By using your teeth and bite as a starting point, the computer simulates the stages that your teeth need to progress through until they reach their final desired position a straight, beautiful smile! Multiple aligners are then created based on these computer designs. 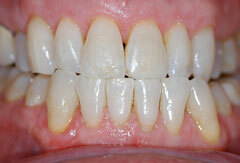 Each aligner is worn for approximately two weeks. We recommend wearing the aligner all the time, except when you eat, brush or floss. 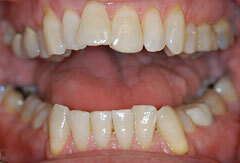 As you replace each aligner with a new one, your teeth are gradually being guided into their new position. The number of aligners you will need depends on the complexity of your individual case. The usual number of aligners ranges between 18 and 30. The total treatment time is approximately the same as for traditional braces. If your teeth are too crowded or too far apart, or if your teeth have shifted since your childhood braces, you are likely a candidate for Invisalign treatment. Call us for a complimentary half-hour consultation to find out if Invisalign is right for you! Dr. Mazza is an Invisalign® certified dentist in Bethesda, Maryland, specializing in cosmetic dentistry.